A key research concern of the project, Land of the Blind, is the defining relationship between capital and labour. As part of the mandate of this blog is to engage and present material that holds resonance concerning the contemporary context of the thematics which motivated the 1913 Dublin Lockout. Currently on display at the Austrian Cultural Forum New York is a group show curated by Oliver Ressler and Gregory Sholette. The title of the show ‘derives its name from the slogan which in the early 1990s came to define then presidential candidate Bill Clinton’s campaign, “It’s the economy, stupid”’. 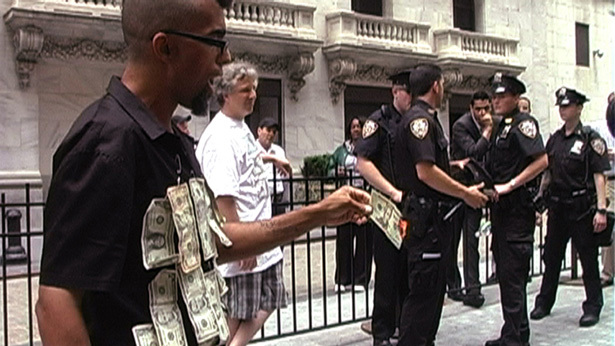 Dread Scott, Still from “Money to burn,” 2010, video. The economic crisis that we face today has also become a major crisis for representative democracy. The very idea of the modern nation state is in jeopardy as the deterritorialized flow of finance capital melts down all that was once solid into raw material for market speculation. It is the social order itself, and the very notion of governance with its archaic promise of security and happiness that has become another kind of modern ruin. It’s the Political Economy, Stupid brings together an international group of artists who focus on the current crisis in a sustained and critical manner. Rather than acquiesce to the current calamity, this exhibition asks if it is not time to push back against the disciplinary dictates of the capitalist logic and, by use of artistic means, launch a rescue of the very notion of the social itself. The artists included are Linda BILDA, Julia CHRISTENSEN, Yevgeniy FIKS / Olga KOPENKINA / Alexandra LERMAN, FLO6x8, Melanie GILLIGAN, Jan Peter HAMMER, Alicia HERRERO, INSTITUTE FOR WISHFUL THINKING, Zanny BEGG / Oliver RESSLER, Isa ROSENBERGER, Dread SCOTT. You are currently viewing the archives for February, 2012 at THEMARKET.